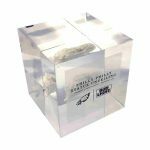 Custom Lucite celebrating the unveiling of the "Philly Philly" statue at Lincoln Financial Field commemorating a crucial play in the victory of the Philadelphia Eagles in Super Bowl LII. 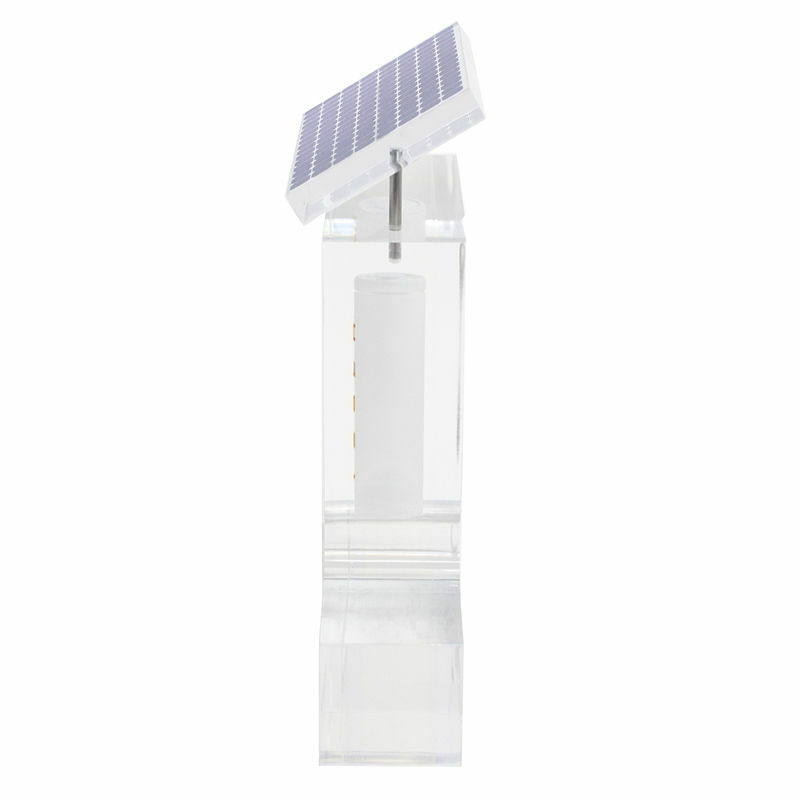 Embedded within the piece are fragments from the mold used for the statue. 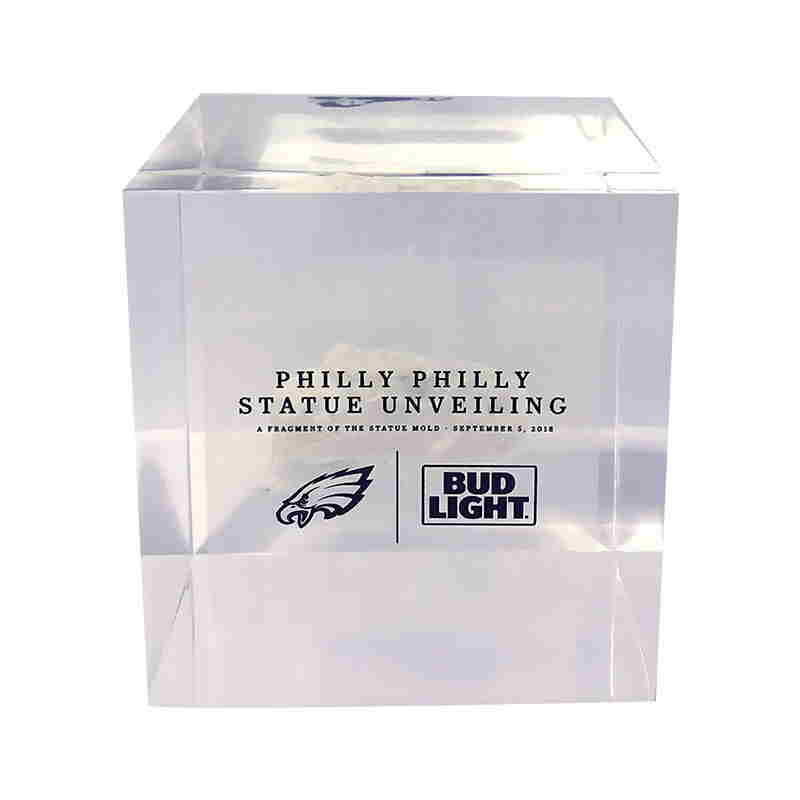 Lucite embedment marking the unveiling of the "Philly Philly" statue at Lincoln Financial Field. 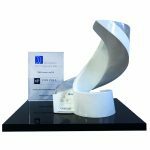 The bronze statue commemorates a crucial play in the victory of the Philadelphia Eagles over the New England Patriots in Super Bowl LII. 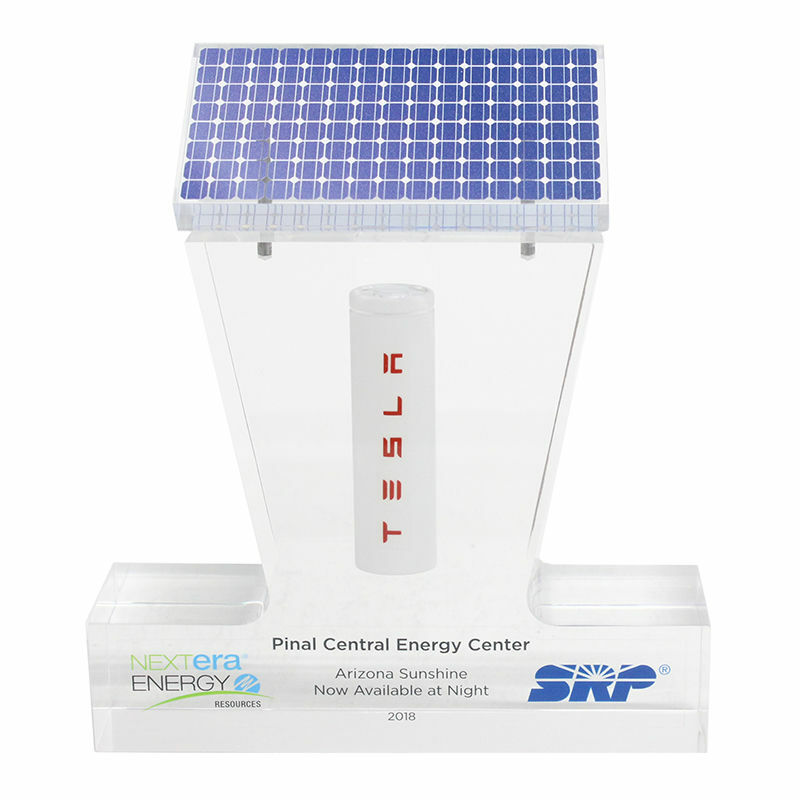 Embedded within the piece are shards of the mold used for the statue. 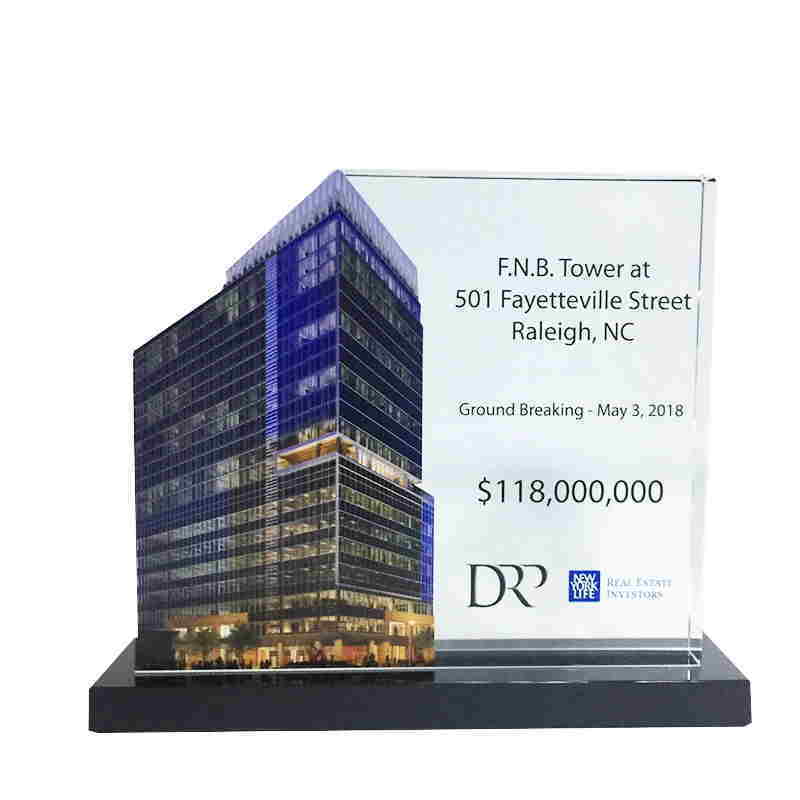 Custom crystal commemorating the groundbreaking for the 22-story FNB Tower in Raleigh, North Carolina. 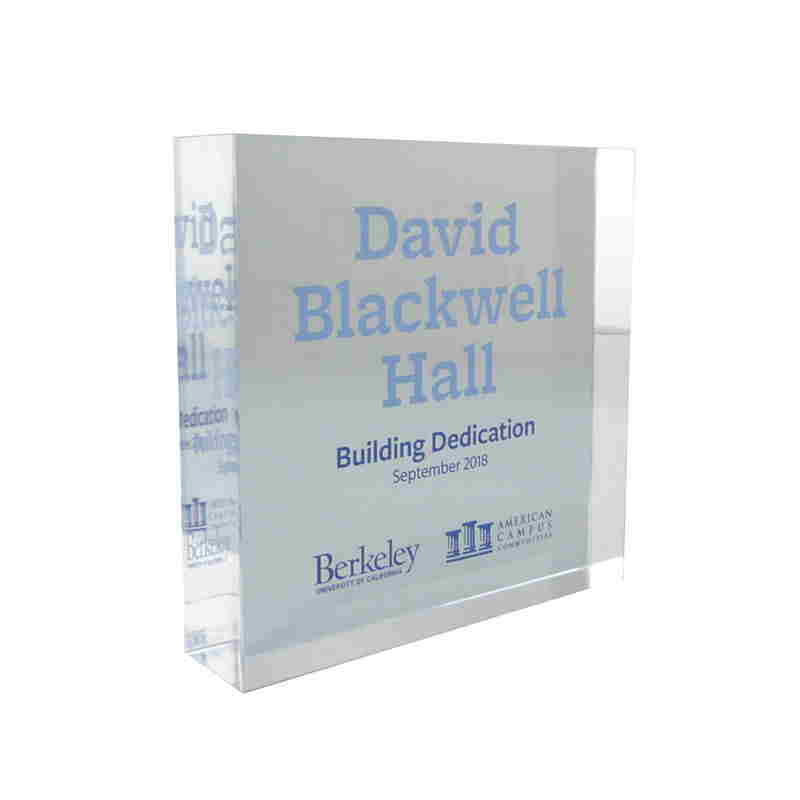 Custom Lucite commemorating the dedication of David Blackwell Hall, a freshman dormitory on the campus of the University of California, Berkeley. 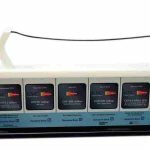 A prominent statistician, Blackwell was the first black professor to receive tenure at UC, Berkeley. 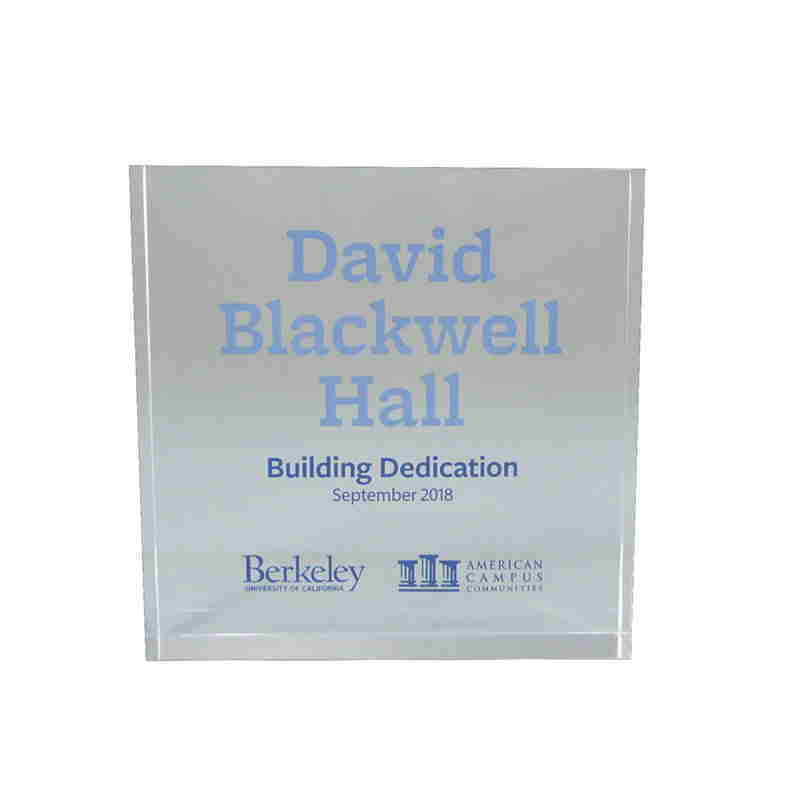 Lucite commemorative making the dedication of David Blackwell Hall, a dormitory on the campus of the University of California, Berkeley. 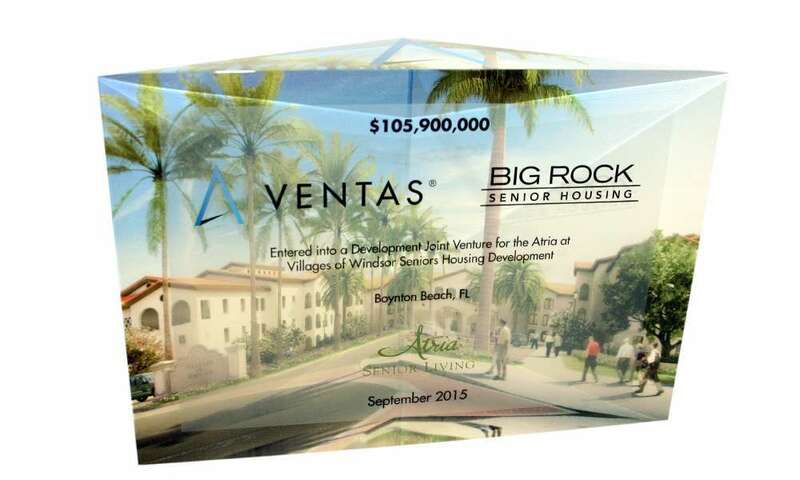 The building is the first residence hall to open on the CAL campus since 2012. 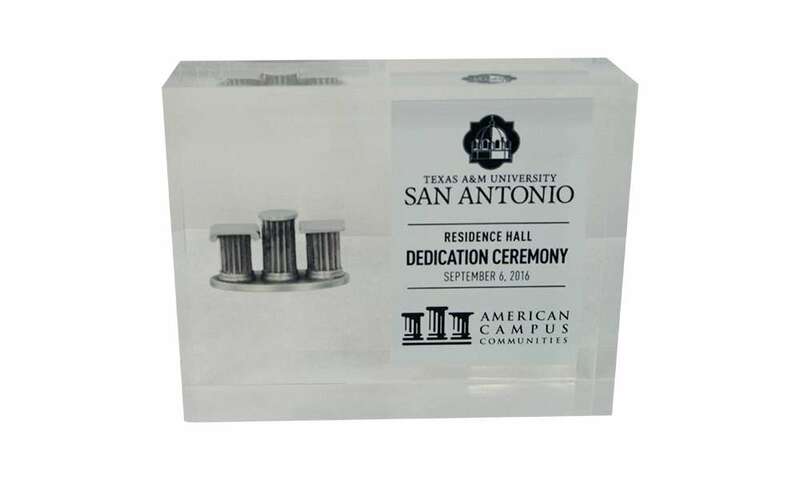 Custom Lucite commemorating the dedication ceremony for the first residence hall at Texas A&M San Antonio. 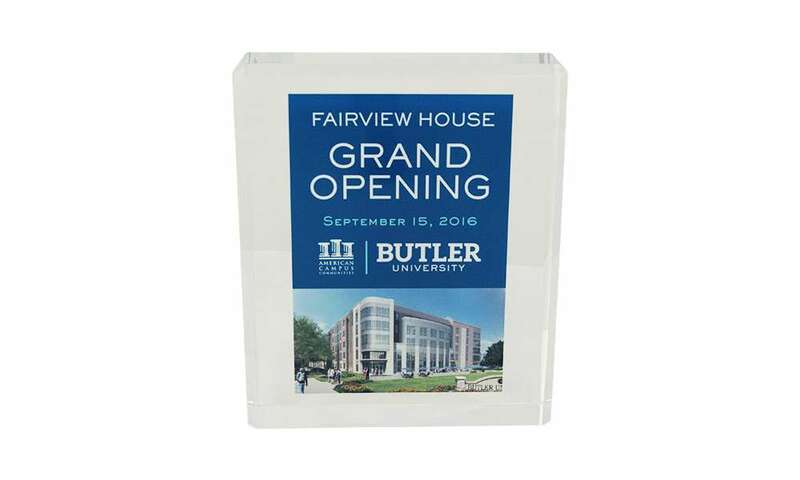 Custom Lucite commemorating the grand opening of Fairview House, a student residence hall on the campus of Butler University. 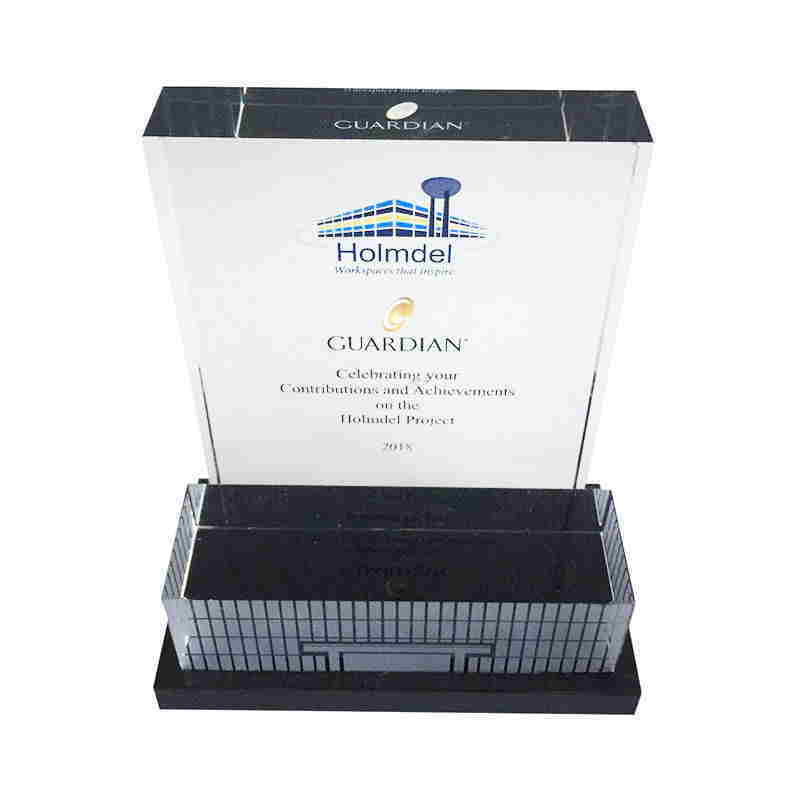 Custom crystal recognizing contributions to the opening by Guardian Life Insurance Company of a 90,000 square-foot technology hub . 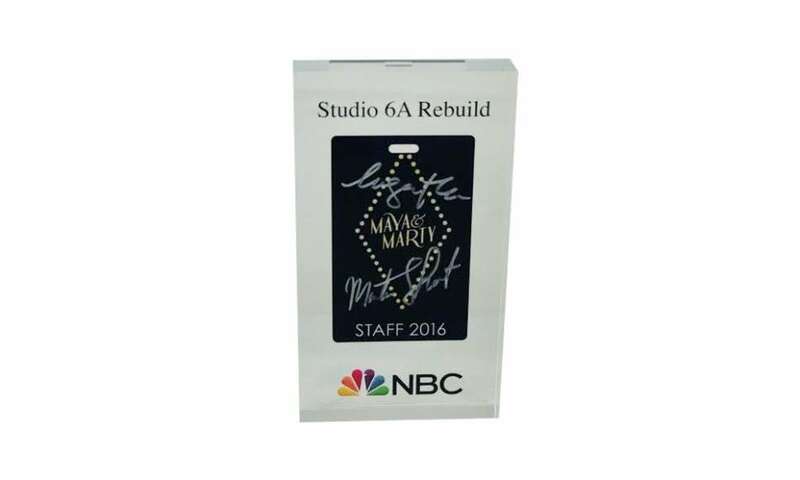 The glass-enclosed complex is located in Holmdel, New Jersey. 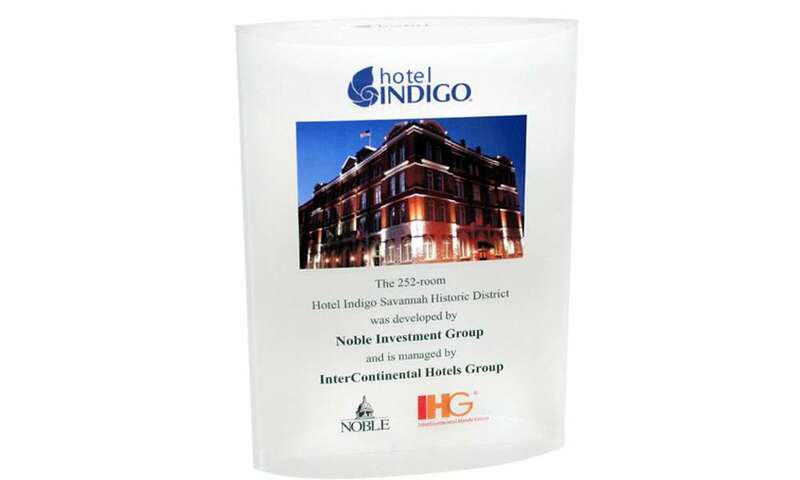 Custom acrylic award celebrating the opening of the Hotel Indigo in the Historic District of Savannah, Georgia. 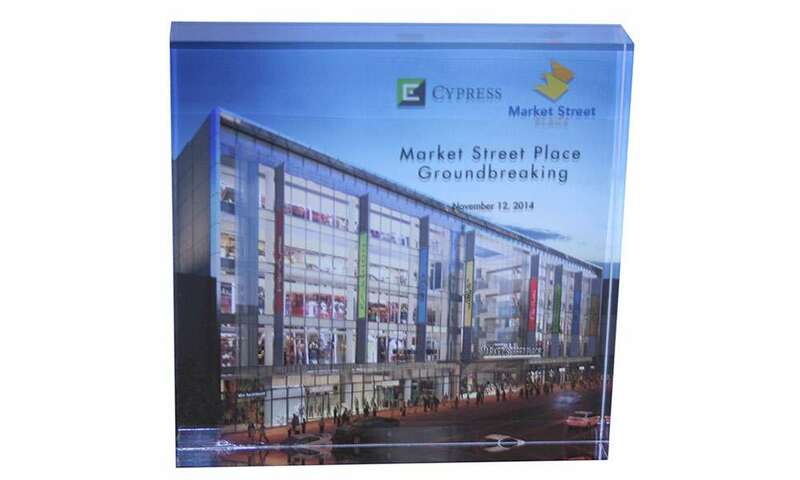 Custom Lucite commemorating groundbreaking for Market Street Place, a 5-story retail complex located near Union Square in San Francisco. 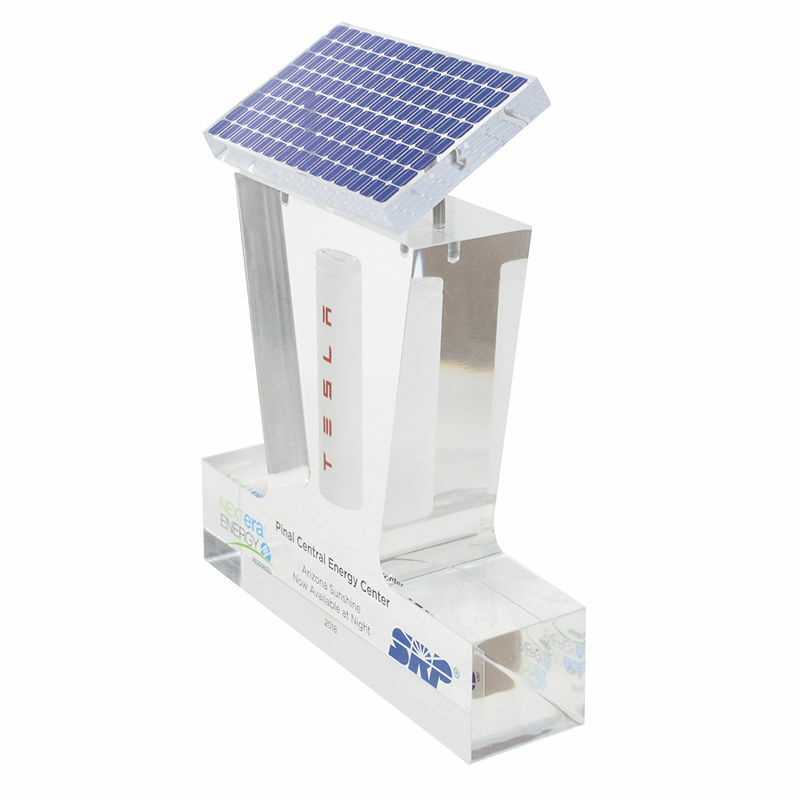 Custom crystal award marking the beginning of commercial operation of two solar plants located in San Bernardino County, California. 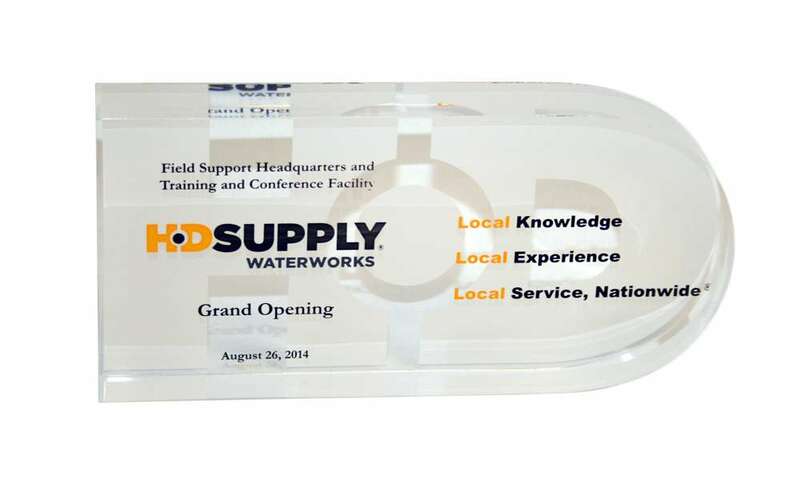 Custom Lucite commemorating the opening of a new facility for HD Supply Waterworks, a distributor of storm, sewer, water, and fire protection products. 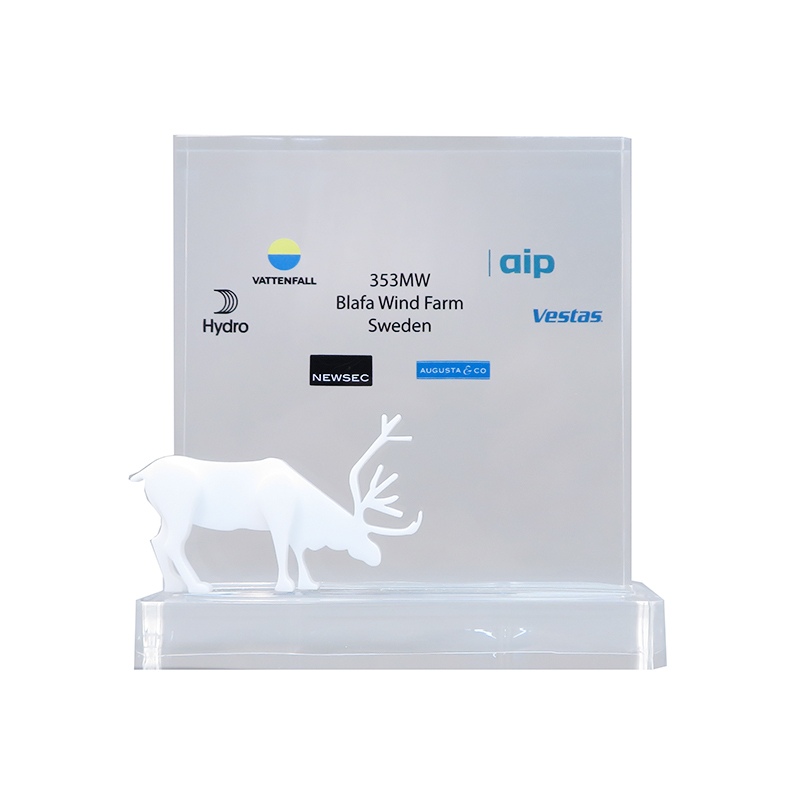 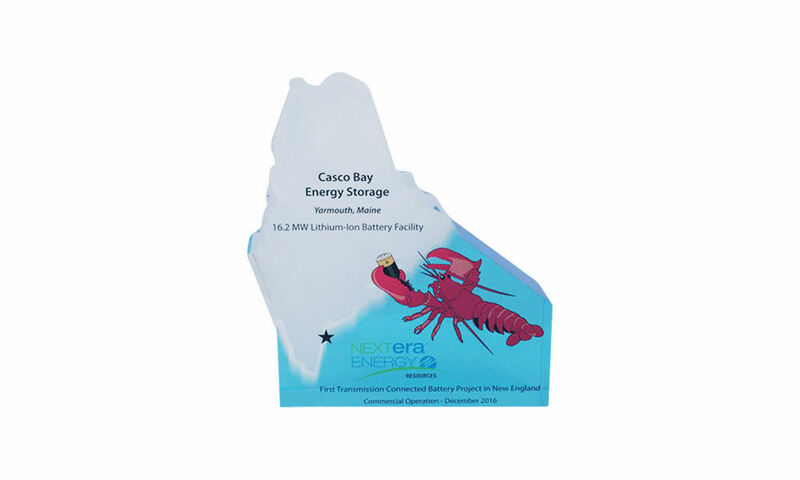 Custom acrylic award commemorating the beginning of operations at New England's largest power storage battery, located in Yarmouth, Maine. 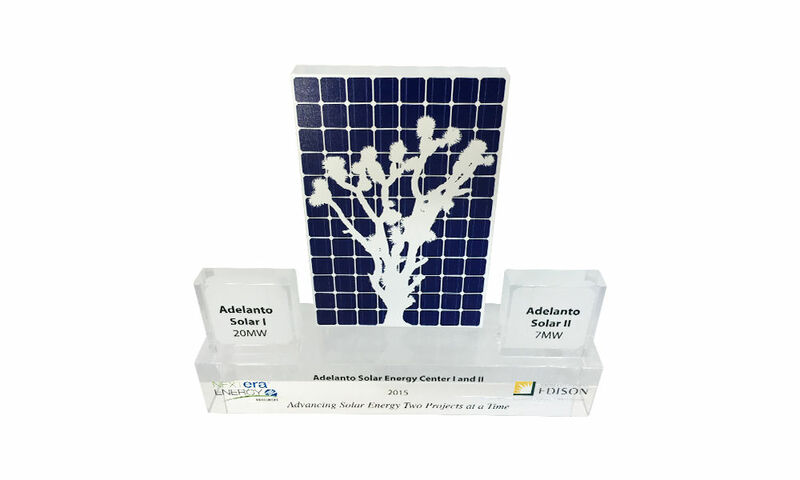 Custom crystal celebrating the opening by Guardian Life Insurance Company of a 90,000 square-foot technology hub . 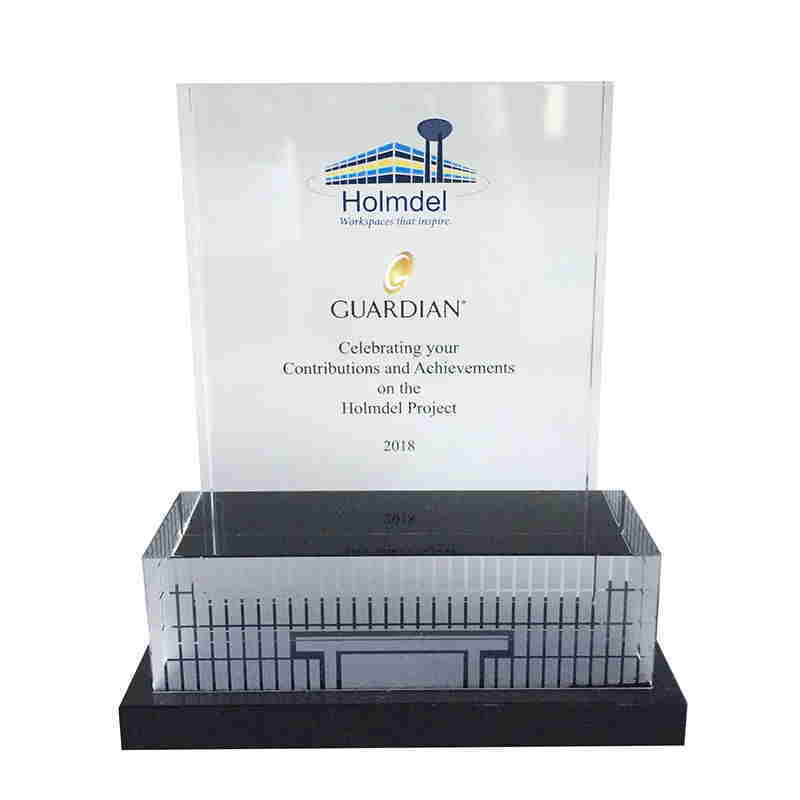 The glass-enclosed complex is located in Holmdel, New Jersey. 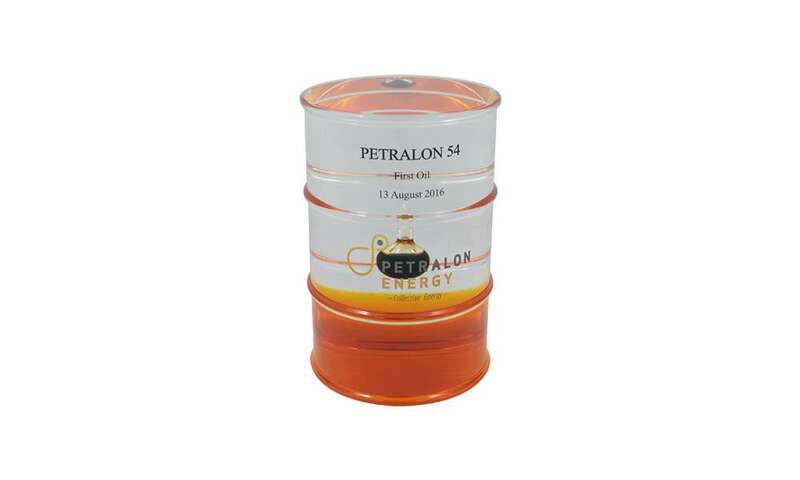 Custom acrylic oil barrel award, with an embedded oil vial, commemorating a "first oil" hit by Petralon Energy of Nigeria. 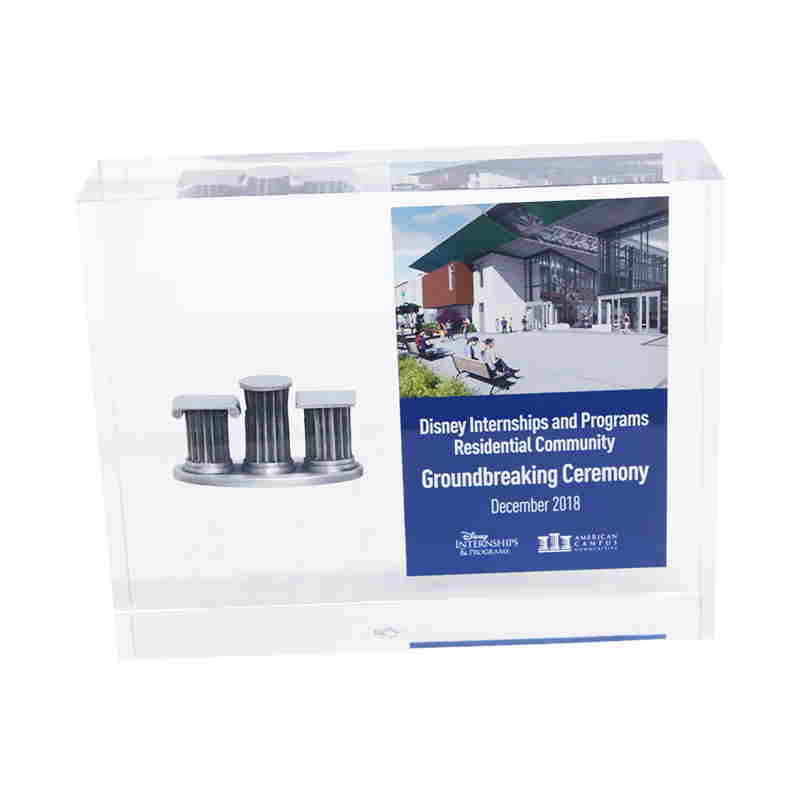 Custom Lucite marking the construction of a residential projects for students at Trinity College. 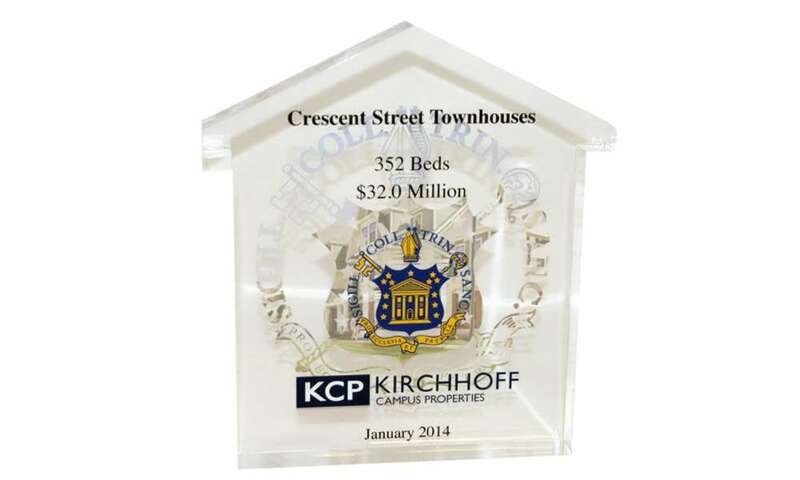 The Crescent Street Townhouses dormitory project was developed by New York-based Kirchoff Campus Properties. 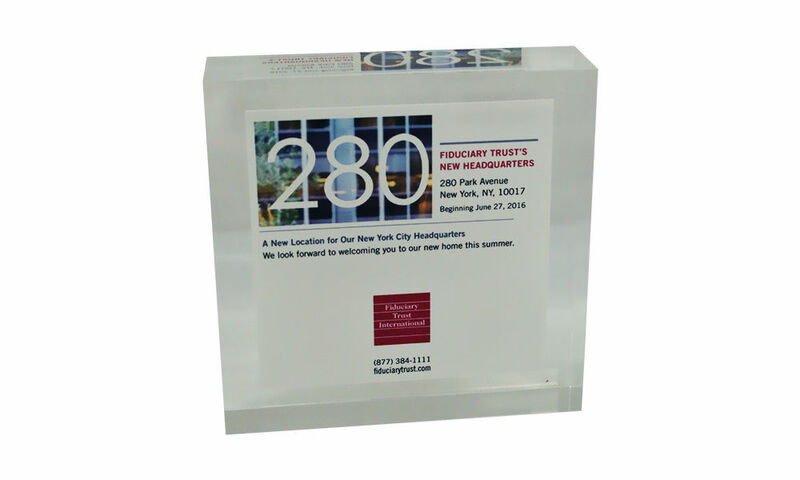 Custom Lucite commemorating the relocation of the corporate headquarters of Fiduciary Trust Company International, the investment management firm.